pricing pressure as customers turn more cautious on increasing risks of trade tensions. However, most companies remain positive for the long term on more new projects and diversified customer base. Our top pick is Valuetronics. Two out of three companies missed our net profit forecasts. In 3Q18, Sunningdale Tech (SGX:BHQ) and Memtech International (SGX:BOL) missed our net profit forecasts. Although Valuetronics (SGX:BN2) earnings were in line, its headline net profit was affected by a flood. Overall, we reduced our FY18-19 net profit estimates by 5% and 18%: Sunningdale (16% and 18%), Memtech (5%) and Valuetronics (2% and 5%). Headwinds impacted gross margins particularly; top-line growth remained healthy. Some customers have even delayed orders to wait for a recovery in consumers’ sentiment. Sunningdale and Memtech recorded revenue growth but their gross margins were impacted by rising costs and pricing pressure. Valuetronics reported a marginal decline in revenue but a higher gross margin due to better performance from its higher-margin industrial and commercial electronics (ICE) segment and a temporary disruption to its lower-margin consumer electronics (CE) segment. Long-term prospects remain positive on more future orders. All companies remain confident in securing more orders, especially in the consumer electronics and automobile segments. Valuetronics continues to see good demand for connectivity modules used in the automobile industry while Memtech expects delayed orders from a major US MNC client to flow through in 1Q19. Sunningdale is confident of its resilient business model, backed by its global presence which spans 20 manufacturing sites in nine different countries. 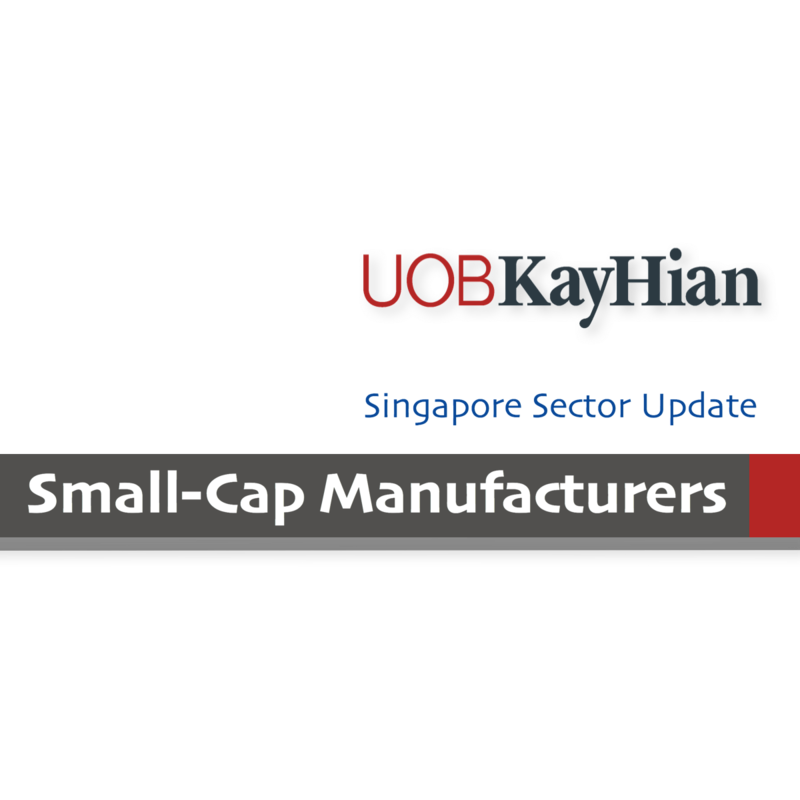 Valuetronics is the only BUY among small-cap manufacturing companies under our coverage. Its valuation remains attractive at 2.2x FY19F EV/EBITDA and FY19F ex-cash PE of 3.3x. Its net cash continued to increase to S$152.7m, or 55% of its market cap. 2QFY19 net profit declined 13% y-o-y due to a one-off flood provision. Excluding that, net profit would have increased 14% y-o-y. Growth momentum of the ICE segment remained robust at 21% y-o-y, while that of the CE segment fell 22% y-o-y due to temporary disruption from the flood. We cut our FY19-20 EPS forecasts by 5% and 2% to include provision for the flood, and reduce our target price from S$0.96 to S$0.87, pegged to peers’ average of 10.9x FY19F PE. Valuetronics' business outlook remains positive. Maintain BUY. 3Q18 core net profit missed our expectations, declining 52% y-o-y due to gross margin compression. 9M18 core net profit met only 65% of our full-year estimate. We cut our FY18-20F EPS forecasts by 14-18%. Sunningdale is cautious of headwinds from rising production costs and the trade war but remains confident of its resilient and diversified business model. Downgrade to HOLD and cut our target price by 12% to S$1.50, pegged to peers’ average of 10.6x 2019F PE. Entry price is S$1.25. 3Q18 net profit fell 19% y-o-y and missed our expectations, 9M18 net profit met only 64% of our full-year estimate. Gross margin was compressed due to rising input costs and project delays at several key customers. We cut our 2018-20 net profit forecasts by 5% each, and cut our PE-based target price to S$0.91 from S$0.95 (9.6x 2018F PE). Memtech is optimistic of a better 2019 on a healthy pipeline of new projects. Maintain HOLD. Entry price is S$0.70.